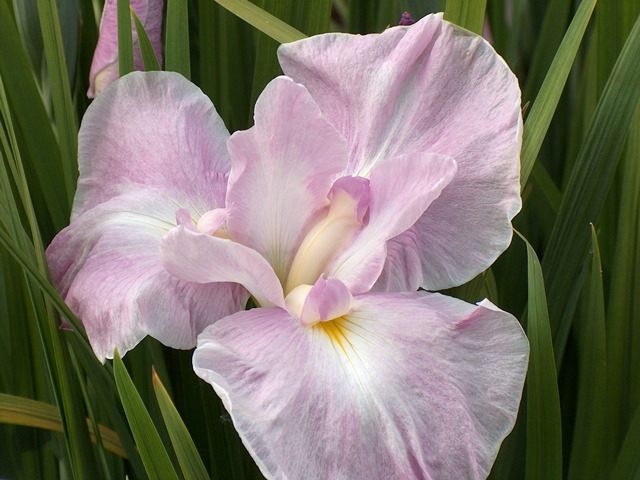 The quest for a strong pink Iris ensata has been a breeding goal for many modern hybridizers. The Iris ensata pink is a pastel violet as there are only three colors found with this iris to work with; violet-blue, violet-red, and Alba (white). 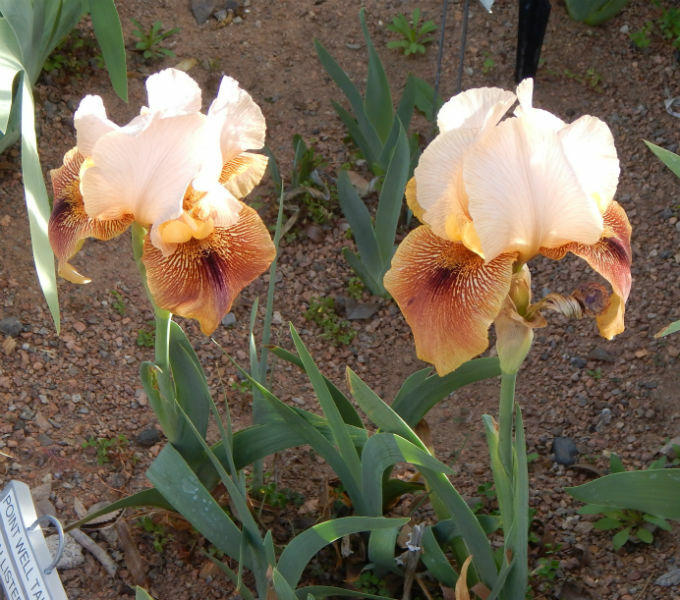 This color is most notable in the iris garden when compared to a true pink rose seen side by side with the iris. Many problems with this color line are plaguing us due to previous breeding’s in Japan; most evident is from the Ise line. This line of breeding has given us good clear pastel pink tones. However, the plants were bred to be shorter with their blooms lower than the foliage height. The flower form of the Ise style also is problematic with drooping falls found normally with very little substance. A more modern hybridizer of Japan that worked with pinks gave us some bright colored flowers with substance. However his selection of plants has given us a stumbling block of poor plant performance, by purposely selecting weaker plants. As there were no records kept, no one knows why he did this. Many hybridizers in the United States have recently introduced clearer pinks with strong growth habits, displaying the blooms above the foliage. I regret not showing photos of these at this time as they are still in the American Iris Society’s award system. 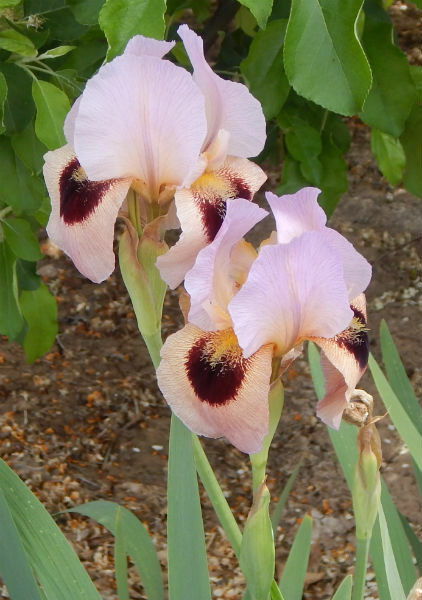 The following are some older pink iris’ that can be readily found on the open market for your garden. Many are the same that I started with in my own breeding program over thirty-five years ago with a quest for pink. Which is your favorite? 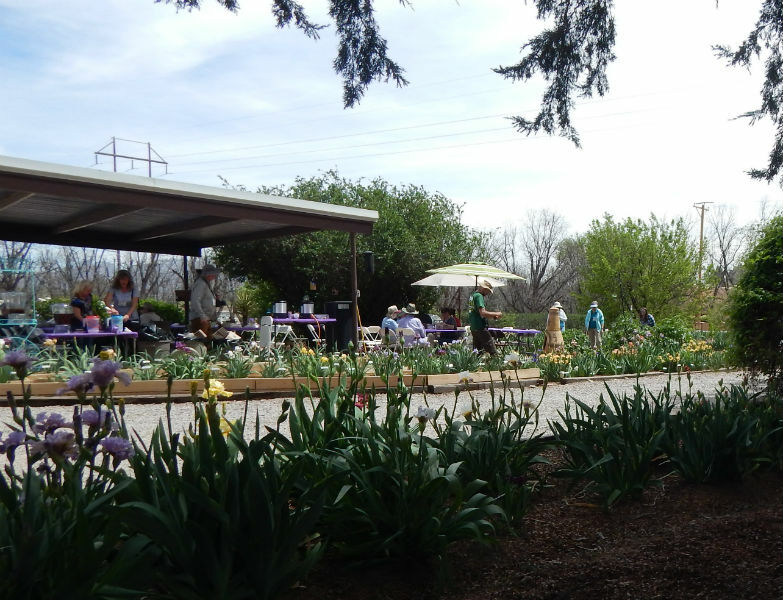 On April 6 and 7, aril and arilbred enthusiasts from parts far and wide converged on Las Cruces, New Mexico, to enjoy each other's company and an astonishing array of arilbreds in bloom. 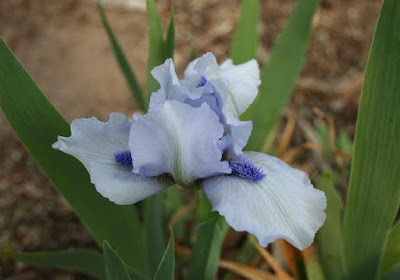 The Aril Trek was a joint undertaking of the Aril Society International and the Mesilla Valley Iris Society, and the arrangements were all excellent and smoothly executed. Friday evening registration was followed an educational session of "aril bingo" and a panel discussion with Dell Perry, Pete McGrath, Rick Tasco, Perry Dyer, and (much to my surprise) yours truly. The heart of the weekend was four garden tours on Saturday: the small but beautifully designed Pountney garden in the residential Tortugas area south of Las Cruces, the expansive Dash garden high in the West Mesa desert, the glorious Wilson Garden north of the city, with row upon abundant row of perfectly grown irises of many types, and the delightfully ornamented Ayres garden, northeast of the city. The timing seemed perfect for arilbreds, with both halfbreds and quarterbreds apparently near peak bloom, amidst late medians and early TBs. 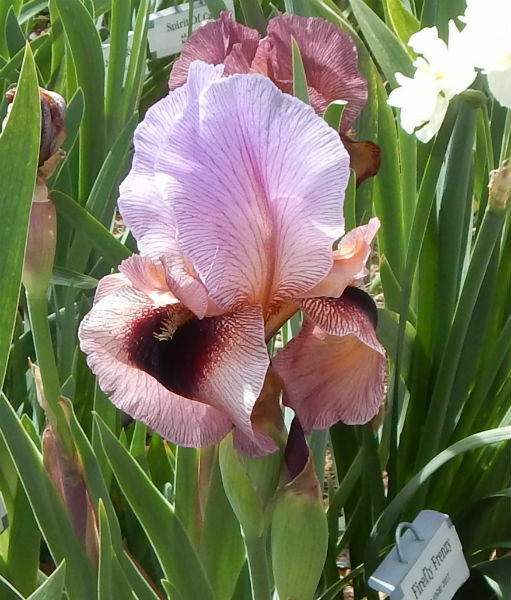 I got to see many old and new cultivars in bloom that I have not grown myself. 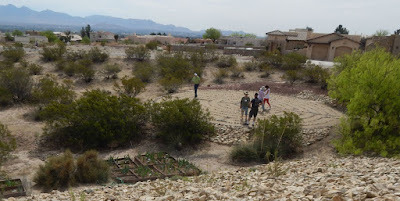 It was also rewarding to see such fine arilbred performance in gardens with such different growing conditions: desert sand to river-valley clay, cool verdant niches to sites exposed to the full sun, wind, and temperature extremes of southern New Mexico. Saturday afternoon featured informative judges training led by Dell Perry (who took us through the intricacies of aril and arilbred classification and characteristics with verve and expertise) and Perry Dyer (who applied his experience and keen eye to show how to look at these varied plants in the garden). Yes, I did pass the test at the end! At the Saturday night dinner, keynote speaker Pete McGrath amazed us all with slides of startlingly beautiful pure aril hybrids and tantalizing arilbred seedlings from his continuing effort to bring bolder veining into this group. 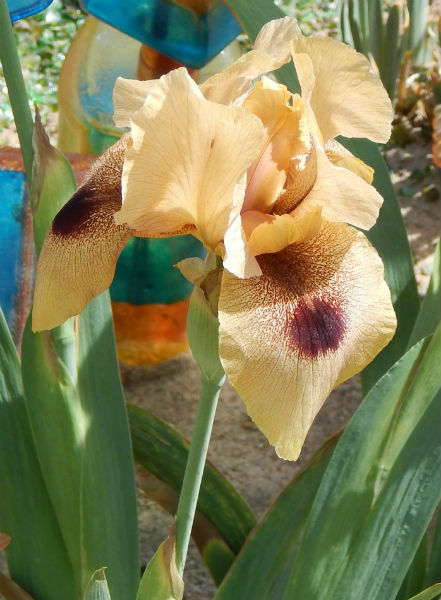 Pete's talk was also a story of his experience with aril and arilbred irises, full of deep disappointments and unexpected rewards, and always coming back to the personal dimension: the people and relationships that affected him and his work, often in profound ways. It was a great weekend. I particularly enjoyed renewing old acquaintances in the iris world, and meeting other new friends I had only known on line. 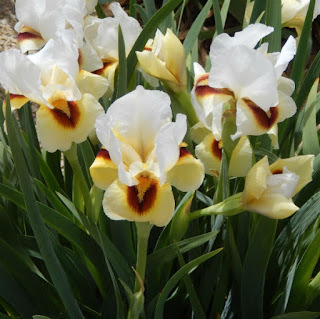 If you are an iris lover, but not sure if you can manage the time and expense of attending a national convention, regional and special-interest gatherings such as the Aril Trek are a comfortable and rewarding way to see some beautiful iris gardens and meet many wonderful people! 2017 was not the best iris year in Oregon. Our rainy season was a VERY rainy season, with over 45” of rain from October-April. Bearded irises that appreciate dry weather were not at all happy and a bed of Pacific Coast Natives were virtually wiped out after being flooded. The spurias were another story. In spite of the rain, the bloom on the spurias was especially good and every plant bloomed almost in excess, making up for their bearded cousins. For example, several years ago I planted 8 cultivars in a bed bordering a huge Douglas fir stump, in an effort to obscure this stump. It worked like a charm and I defy you to see the stump now and there were close to 100 stalks in that very small garden. As much as I enjoy growing irises, hybridizing is my raison d’etre. I can’t help but look at a plant and not think of a way in which to improve it. Before I left MS, I was crossing a lot with my spuria ‘Banned in Boston’. It had lots of qualities I like in a spuria as the blooms are wide and the strong striping of dark purple on the falls is very distinct. The stalk is wonderful as the blooms open nicely with no crowding and all the flowers open well. The last year in MS, I crossed ‘Banned in Boston’ with ‘Destination’ and ‘Missouri Orange’, hoping to get a spuria with the basic color of ‘Banned in Boston’ but with a large orange signal to contrast with the purple striping. These seedlings bloomed in ’13 and ’14 and were a fairly motley bunch, mostly sort of dirtied purples and bronzes. Sometimes hybridizers have to hold their noses and make a cross that doesn’t look that good to the eye, but you know has “wonderful genes”. So, I dutifully crossed the best flower from each of the two groups of ‘Banned in Boston’ X orange crosses in ’14 and ’15. Most of these seedling bloomed this spring and although I didn’t get the planned-for ‘Banned in Boston’ with orange signal, what came out was a very nice crop of brown spurias with stripes of brown on an orange background. Although most of the seedlings had striping only on the falls, a number of the seedlings also had striping on the standards as well as the falls. This pattern had occurred in some of the other colors of ‘Banned in Boston’ seedlings but it seemed especially striking on these brown over orange combinations. From the Editor: This article first appeared in Spuria News, the bi-annual newsletter by the Spuria Irises Society. Reprinted by permission of the author. 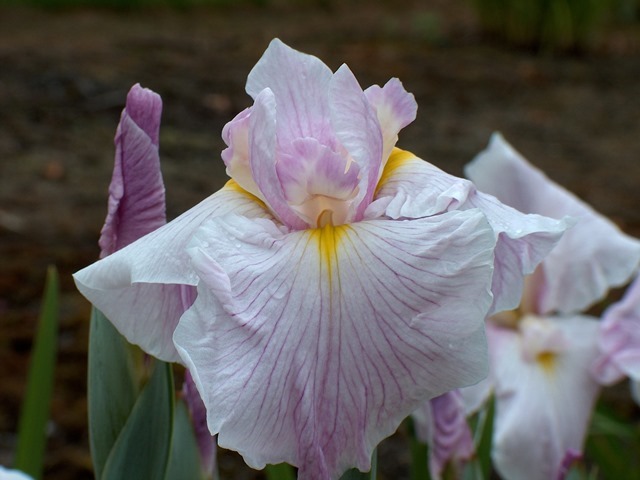 The Spuria Iris Society is a section of The American Iris Society, and is dedicated to expanding the public's knowledge of spuria iris. For more information about growing spuria irises and/or becoming a member of the society please visit their website. For a change of pace, I’ve been making iris leaf cordage, using a simple three strand twist of dead Iris douglasiana leaves. Using fine thin leaves, this works up quickly into cord. The leaves are individually twisted counterclockwise and then wrapped clockwise around the other two twists. 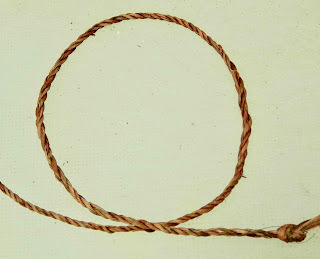 These cords are twisted together or braided to make stronger ropes. 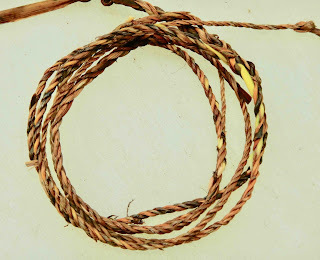 This method is widespread in Europe and North America as a way to make cords from many plant species, including nettles, milkweed, flax and other plants. larger leaf. Next time, I'll split the leaves into uniform widths first. Harvesting Pacifica Iris leaves when they have just turned brown probably gives a stronger cord. I went out this winter between rain squalls to get dead leaves, and quickly focused on thin, still-strong leaves of Iris douglasiana selections like Iris ‘Mission Santa Cruz’. I have several larger leaved selections, so could make larger cords from those leaves. 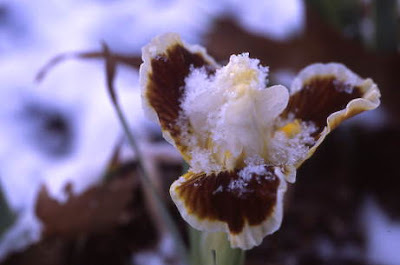 Something to remember for next fall —harvest iris leaves at the right time, between loss of green in fall and subsequent decay in late winter. Clean and dry, the leaves can be stored for months, then soaked in water to prepare to twist. so did not need a presoaking in water to soften before using. West Coast tribes in northern California made rope from Pacifica Iris leaf fibers. Leaves were harvested from late summer into fall, wilted, then split and scraped to remove a strong fiber, one from each side of the leaf. 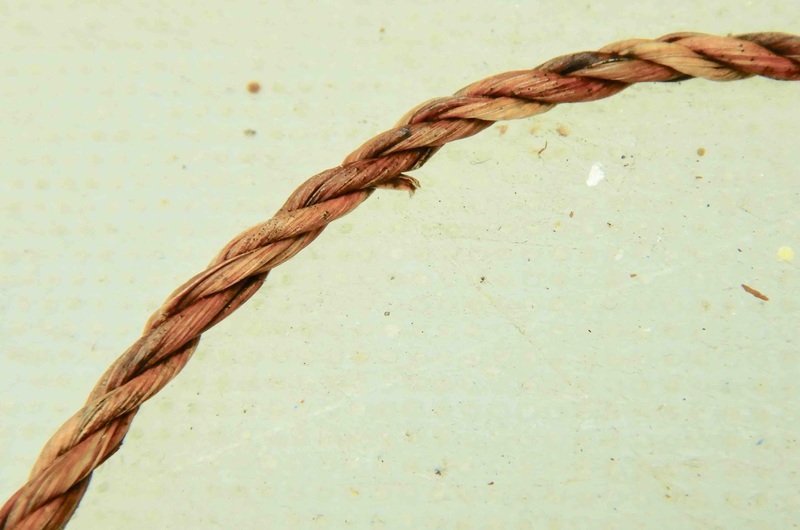 Fibers were rolled and twisted into fine cord, then multiple cords were twisted together to make strong light ropes. Strong lines to trap deer and elk were made from those ropes. The processing that went into removing and cleaning the fibers, then twisting into cordage, then wrapping cords to make rope, and making nets from the rope, was considerable. Read more about this method here: http://www.paleotechnics.com/Articles/Irisarticle.html . 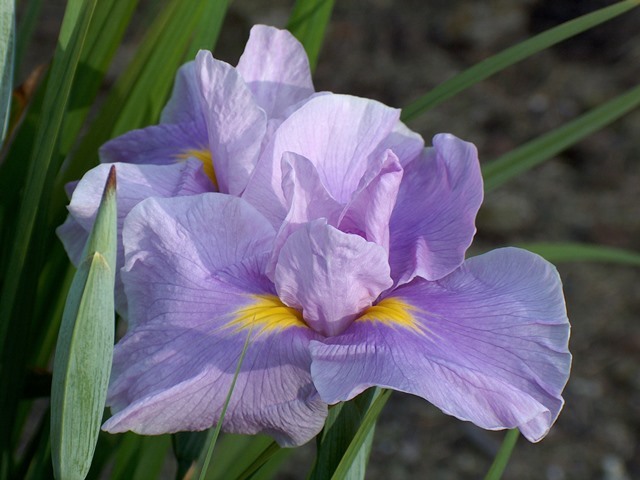 Irises, including all Pacifica Iris, have the same strong fibers in their leaves. Years ago the general iris leaf structure of two outer layers of leaf linked by fibrous cross walls was compared to a I-beam--creating a strong, flexible leaf. 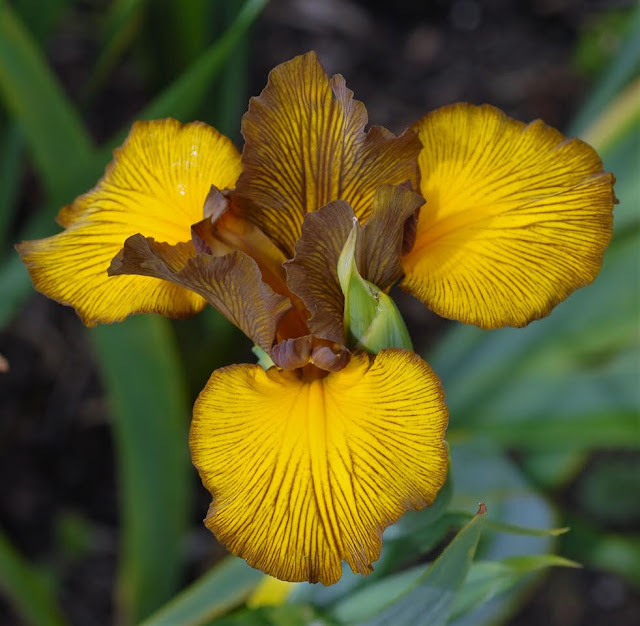 The authors looked at dozens of species in many iris sections, and while the cross-beams changed a bit in shape, the basic plan did not, across all species they examined. If you have access to a college library, look for "Structure and mechanics of the iris leaf", Journal of Materials Science, vol 23, pages 3041-3048, by L. J. Gibson, M.F. Ashby and K.E. Easterling, published in 1988. Iris douglaisana, I. macrosiphon, I. purdyi and natural hybrids of these species seem to contain the right vein structure in their leaves, with two larger veins running up the outside edges. I suspect this is because they tend to have larger leaves. The thin end, made from fine leaves. 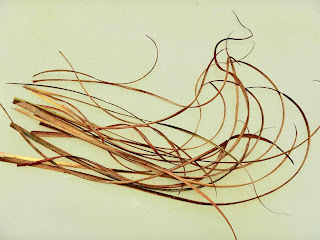 During dry moments this winter, I also collected long green leaves from several Pacifica Iris plants to see if there are usable fibers in them. It’s a little late in the year, but on the West Coast, this winter has been mild and wet, and iris leaves are still green. As with other fiber-containing species, longer iris leaves produce longer fibers, which spin more easily into cordage. 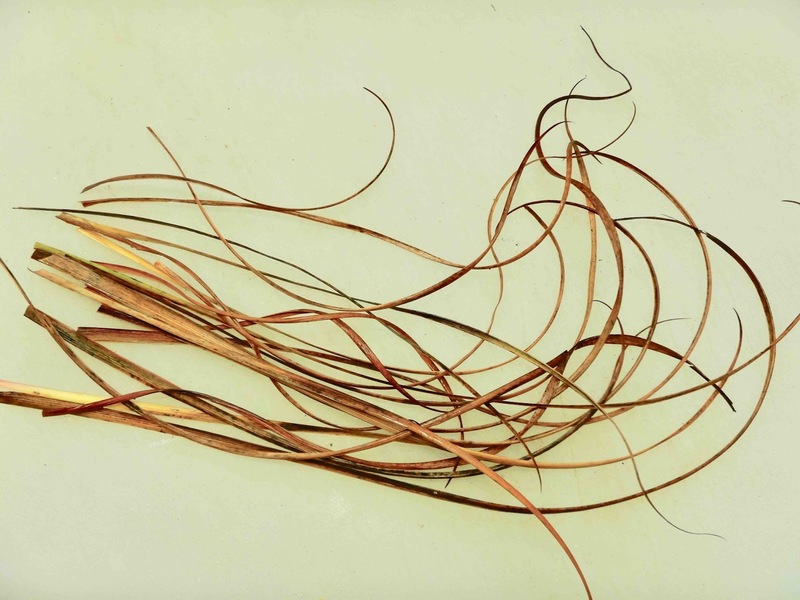 Now I wonder what the leaf fibers are like in Iris unguicularis, I. lazica, ornamental Carex, milkweed, and Diplorrhena. in brown Pacifica Iris leaves. It’s a slippery slope from playing with natural cordage to spinning your own yarn, I understand, and I’m hoping to not be enticed into another hobby just yet. My goal is to garden as long as I can, and only then retire to less taxing hobbies.